In Canada, screening for colorectal cancer can be done using the FOBT or FIT tests. These currently have suboptimal diagnostic accuracy, which is why researchers are investigating other avenues for non-invasive detection of early CRC. Scientists have found that in many early-stage cancers, including CRC, epigenetic alterations are present in much higher frequency than genetic mutations. As such, DNA methylation, ncRNAs, histone modifications are being investigated for potential diagnostic and prognostic markers of CRC. Blood, stool, saliva and urine are being examined by the research community for these markers. 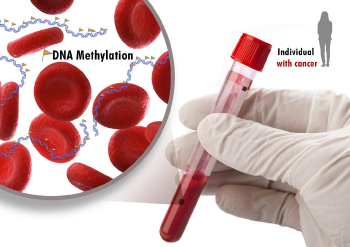 DNA methylation in particular is being studied extensively, and some groups have reported sensitivities of 90-95% with specificity ranges of 85-94% for certain biomarkers in CRC. Some genes have risen to be the most promising markers, including the tumor specific M2 isoform of pyruvate kinase (PKM2), tissue inhibitor of matrix metalloproteinase 1 (TIMP1), vimentin (VIM) and septin 9 (SEPT9). DNA methylation is also being investigated for prognostic biomarkers and predictive markers for response to treatment. In particular, CpG island methylator phenotype (CIMP) positive cancers are found to correlate strongly with overall unfavorable prognosis, but seem to benefit from 5-FU based adjuvant chemotherapy. Hypermethylated Transcription Factor AP-2 Epsilon (TFAP2E) seems to also predict response to 5-FU based chemotherapy. Diagnostic and prognostic biomarkers using histone modifications have been much less studied, partly due to technical limitations of assays that are used to characterize the chromatin landscape. Some studies show acetylation of H3 lysine 56 and di- or tri-methylation of H3 lysine 9 and 27 have potential to be prognostic markers in CRC. These results are still currently preliminary and are expected to be further explored with the new bioinformatic tools and next-generation sequencing technologies that are being optimized. On the other hand, non-coding RNAs, and in particular miRNAs, have triggered a substantial interest from the scientific community. Blood and stool based biomarkers have been investigated, and multiple candidates such as miR-21, miR-92a, miR17-3p or miR-106a have come up as potential diagnostic markers. MiR-21 has also been associated with poor patient survival, and several other miRNAs have been proposed as prognostic markers. As research evolves, scientists hope to engineer a panel of biomarkers that will be able to accurately identify and predict prognosis for early stage CRCs. Epigenetics has offered us new tools to understand the complex etiology of colorectal cancer. As the scientific community further elucidates the mechanisms at play, epigenetic biomarkers to diagnose, classify and predict prognosis of CRC are also uncovered. Further research on these biomarkers may provide us with high performance assays that can be used to prevent and better manage patients with CRC. Sameer, A.S., Nissar, S., 2016. 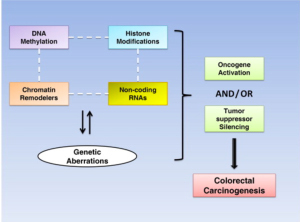 Epigenetics in diagnosis of colorectal cancer. Mol Biol Res Commun 5, 49–57. Consider the genome as words in a book, and epigenetics as the punctuation and accents that dictate the way each sentence is read. Epigenetic regulation refers to the heritable and reversible mechanisms that alter gene expression without affecting the underlying DNA sequence. Epigenetic mechanisms, among others, include DNA methylation, non-coding RNAs, chromatin remodelers and histone post-translational modifications. They play a crucial role in the proper functioning of a cell. In cancer, genetic and epigenetic alterations are linked together and can both contribute to the activation of oncogenes and/or the silencing of tumor suppressors. In colorectal cancer (CRC), understanding the epigenetic mechanisms driving pathogenesis have been a focus of the scientific community since the early 2000s. Many potential driver aberrations have been found, but as with genetic mutations, there isn’t a single mechanism that can explain CRC development. DNA methylation refers to the addition of a methyl group to a nucleotide, usually a cytosine in a CG context. When present at CpG islands, it correlates strongly with repression of the nearest gene. Researchers have found global genomic hypomethylation, especially in CIN CRCs, as well as hypermethylation in promoter regions of specific genes such as APC, Cadherin-1 (CDH1), runt-related transcription factor 3 (RUNX3), mutL homolog 1 (MLH1), O-6-methylguanine-DNA methyltransferase (MGMT), cyclin-dependent kinase inhibitor 2A (CDKN2A), and RASSF1A. Other than DNA methylation are histone post-translational modifications. These are the addition of methyl/acetyl/ubiquityl/phosphate groups to the proteins that make up nucleosomes. The modifications regulate the way DNA is compacted in the nucleus, and recruit various proteins involved in activation or repression of gene expression. In CRC, many genes encoding of proteins responsible for these histone modifications are dysregulated, thus changing the epigenomic landscape of the cell. For example, histone deacetylase 2(HDAC2) is upregulated in the early steps of CRC. HDAC1-3, 5 and 7 have also been reported to be upregulated in CRC. Dysregulation of Lysine specific demethylase 1 (LSD1), which interacts with tumor suppressor p53, seems also to increase the proliferation, invasion and metastatic potential of CRC cells. Another type of epigenetic mechanism which can modulate gene expression in CRC is the non-coding RNAs which include the micro-RNAs (miRNA), and long-non-coding RNAs (lncRNA). For example, the miR-200 family are known to be implicated in cancer invasion and migration; the hox transcript antisense intergenic RNA (HOTAIR) is correlated to advanced CRC and enhanced metastatic potential of cancer cells. Epigenetics is still a relatively new field of research. As scientists strive to elucidate the etiology of colorectal cancer, they discover new potential mechanisms at play. Understanding the epigenetic basis of CRC may open the door for new drugs and biomarkers, so be on the lookout!